Home / Blog Posts / Does Your Living Area Seem Dark or Closed Off? 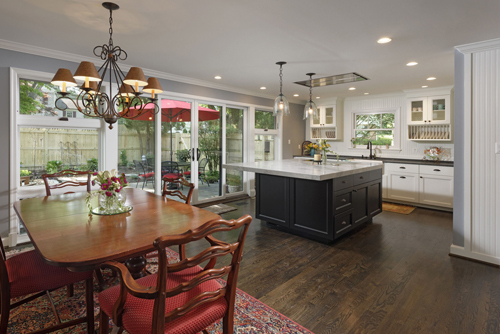 Many clients come to us wanting “more space” or “an open floor plan.” Sometimes an addition to the home is the solution, while other times reconfiguring the existing footprint allows the homeowners to better utilize the space and achieve their goals with the square footage they already have. In some cases, the renovation involves removing walls to create an open-concept living plan and the feeling of more space. On one of our recent projects in McLean, the clients wanted both an open feel for their main-level and a lovely outdoor living space. One free-flowing area was created by removing walls that originally blocked the kitchen from the dining and living rooms. With these walls removed, the once dark space is brightened thanks to an almost full wall of windows and sliding glass doors leading to the new outdoor room. 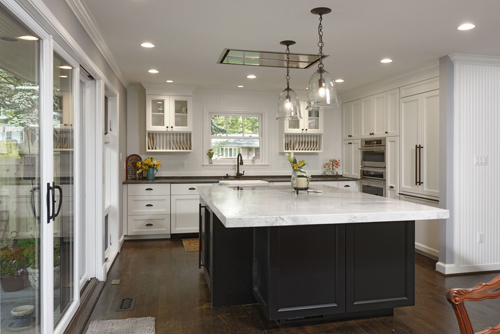 The kitchen was expanded and benefits from a better connection to the adjacent interior and exterior rooms and improved flow. The easy access to the outdoors and natural light that pours through the space make it seem even larger. While additions can address the need for more space in your home, sometimes there are limitations that can’t be overcome, like the size of your property, position of your home or neighborhood restrictions. That is where a qualified design team can make all the difference. An experienced design build firm can help you evaluate your options and decide if your goals are best achieved with a re-design of your existing space, or if an addition is necessary or even possible. Removing walls is not something to be taken lightly. Architectural experts or engineers should always be consulted before taking any walls down. In the case of this renovation, a structural beam was installed in the ceiling making the open floor plan possible. Load bearing walls can be difficult to work around unless you have the knowledge and experience of a qualified remodeling team. Sometimes leaving some separation is advised when opening your space. By keeping one wall between the kitchen and living area, our design team was able to give the client more storage with upper and lower cabinets and give the large area better definition. A clear understanding of your needs and how you plan to use each space will help you and your design team decide the best solution. 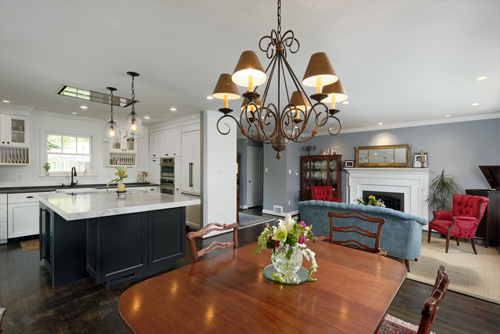 If your home, or a home you’re considering purchasing, feels dark and closed off, perhaps an open-concept update is the solution. Contact the design experts at BOWA and we will gladly help you evaluate your options for achieving a home that better suits your needs and desires.